What did you think of the title of the novel? What does the phrase Object of Affection mean? To whom and what does the title applies to? Which of the two main characters (Paris and Naira) do you most relate to and why? Do you relate to any other characters in the novel? What are some of the themes the novel touched on? Discuss the special friendship Paris and Naira share. Do you share such a friendship with anyone? What are the pros and cons of such a friendship? Discuss what parenthood means to Paris, Naira and Neal. Or, any of the other characters. What does it mean to you? One of the themes explored in the novel is modern women in modern relationships. What do you think about surrogacy and unconventional lifestyle choices? How relevant are they to our times and to you? Do you think Paris was being selfish or selfless about her choices? What about Naira and Neal? What would you have done in their positions? Family is an important theme in the novel. Discuss the various family dynamics shown between Paris, Naira and Neal with each other and with their various families. All the characters changed over the course of the novel. Discuss how and why. Who do you think underwent the biggest change? Did the novel surprise you or change you? If so, why? Paris, Naira and Neal come from diverse backgrounds. What did you learn from them? How are their lifestyles similar to yours or different from yours? Discuss setting. How did it enhance the plot and/or the themes of the novel? Have you read other books by this author? How did they compare with this one? Share a favorite quote. Why is it your favorite? 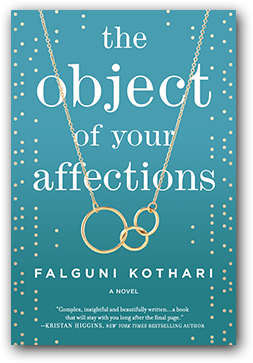 Who would you recommend The Object of Your Affections to? And why?